ew surveys weighing local voters' attitudes on some of the region’s most painful challenges suggest lots of our neighbors are thinking about leaving the Bay Area for good — but that many others are ready to dig into their wallets to help heal at least part of what ails us. The first of two new surveys found that 65 percent of respondents in the five most populous Bay Area counties say the quality of life in the region has gotten worse in the last five years. And 44 percent say they're considering leaving the area in the next few years. Some 6 percent say they've had it and plan to depart the region this year. The sheer expense of getting by in the Bay Area topped the list of reasons residents see life here getting tougher, with 83 percent citing the cost of housing as an "extremely serious" or "very serious" problem, and 81 percent pointing to the cost of living as a major problem. Also high on the list of grievances were two longstanding issues: homelessness, which 79 percent named as extremely or very serious; and traffic congestion, cited by 76 percent. The poll, produced by the Silicon Valley Leadership Group and Bay Area News Group, surveyed more than 1,500 people in Alameda, Contra Costa, San Francisco, San Mateo and Santa Clara counties. "We should all be concerned because that means we're going to have a brain drain of talent and families that contribute to our communities that have simply given up and are going away," said Carl Guardino, president and CEO of the Silicon Valley Leadership Group. "Even if you can afford a home, it's so often not anywhere near your job or your school or where you're trying to get. People are so sick of it that they're willing to make a U-turn right out of the area," he said. Discontent crossed all political, racial, ethnic, geographic and socioeconomic divides, according to the survey. But African-Americans (71 percent), renters (58 percent) and people younger than 40 (55 percent) were the most likely to say they were looking to move out of the Bay Area in coming years. A second survey tested sentiments about two other issues: voters' willingness to tax themselves further to pay for major transportation infrastructure projects and whether they'd be willing to get behind a complex package to address the region's housing affordability crisis. About two-thirds of the 1,900 respondents — this time from all nine Bay Area counties — said they'd support some major funding initiative to pay for a "world-class" transit system, modernizing highways and investing in bike and pedestrian pathways. The survey found that 71 percent of respondents asked about a 1-cent regional sales tax for transportation said they'd support the levy; 64 percent backed the idea of a $50 billion bond measure to be paid for by a new tax on businesses. The idea of a new regional transportation levy — which backers have been quietly promoting for the past 15 months or so as a "mega-measure" for a future ballot — won large margins of support from all age groups, from both renters and homeowners, and Democratic and independent voters. Among Republican respondents, 52 percent opposed a levy and 38 percent were in favor of it. 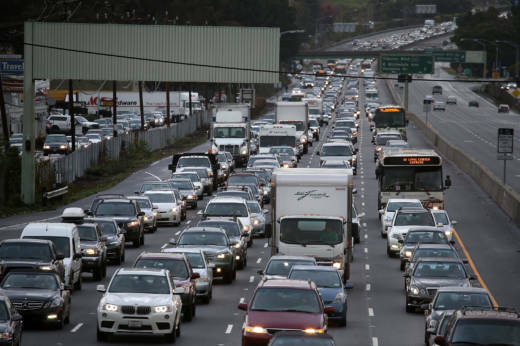 There were some regional variations in the response, too, with the most populous Bay Area counties all giving an enthusiastic thumbs up to a transportation tax. The survey found 79 percent of San Francisco voters supported the idea, with 76 percent support in Alameda County, 68 percent in San Mateo and 66 percent in Santa Clara. Just 46 percent of respondents in Napa County and 49 percent in Solano County supported a new tax. The Silicon Valley Leadership Group's Guardino said his organization — along with the Bay Area Council, which represents more than 300 businesses, public agencies and media companies, and SPUR, a regional urban planning group — is responding to Los Angeles County's success in passing a 1-cent sales tax measure to fund major transportation initiatives. "We've had L.A. envy in that Los Angeles in 2016 passed a permanent 1-cent sales tax that will generate around $120 billion for transit in its first couple decades," he said. "So we continue to see if that’s possible. ... It’s pretty darn clear that the climate seems right, so it’s time to get to work and find out specifically what voters are willing to invest in." While voters acknowledged the region’s crippling housing costs in the first of the new surveys, the second poll found a lukewarm response to an ambitious regional housing plan known as the CASA Compact. It includes an array of housing proposals, like a cap on rent increases and mandates for more dense housing around transit, and it would require approval from the state Legislature, not voters. Just 43 percent of respondents supported the plan, with 42 percent opposed. Specific parts of the CASA plan would need voter approval — namely, any tax that would fund a proposed regional housing agency. That agency would use the money to provide emergency rent assistance to tenants, help cities plan for development and purchase land for affordable housing. Michael Covarrubias, CEO of the real estate developer TMG Partners and a co-chair of the CASA coalition, said it would have made more sense to only poll voters on the housing ideas that could end up on the ballot.